At the Ooltewah High School presentation are, from left, Jesse Nayadley, OHS athletic director; Lisa Rice, SouthEast Bank vice president; and Ooltewah High School Principal Jim Jarvis. SouthEast Bank recently implemented its Prep Promise Program, which uses through donations as well as student and teacher recognitions to benefit high schools that the bank serves. 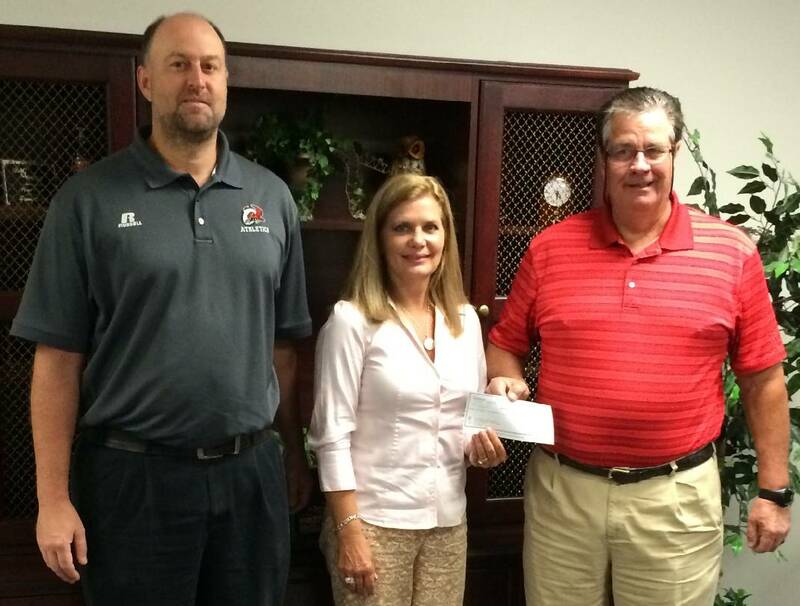 Participating schools, such as Ooltewah High, receive an initial annual donation of $3,500 at the start of the school year. Each month throughout the school year, outstanding students, athletes and staff members are chosen from each partner school and recognized on the bank's website. Additionally, the staff member of the month receives a $100 SouthEast Bank gift card. The Forty & Eight recently presented a $2,000 gift to support its nursing scholarship at Cleveland State Community College in Cleveland, Tenn. The Forty & Eight is a nonprofit that funds numerous causes from child welfare to medicine. Its purpose is to assist and promote the welfare and well-being of those who served in the Armed Forces, as well as their widows and orphans. See Rock City made a $,1500 donation to the MaryEllen Locher Foundation raised through sales of its pink Survivor Birdhouses. The foundation is Rock City's featured community partner during Rocktoberfest, the Lookout Mountain attraction's annual German festival held weekends in October. The donation will help fund scholarships given by the foundation to students whose parents have battled breast cancer. This year's scholarship recipient is Emily Bishop, a student at Lee University who is majoring in nursing. Athens Federal Community Bank has made a $100,000 donation to Tennessee Wesleyan College's "Proud Heritage, Strong Future" campaign. The donation will help fund construction of the new Colloms Campus Center. The new center is expected to provide a central hub of information for students and new meeting spaces, including a banquet center, for campus and community use. Vision Hospital Group made a $1,000 contribution to Friends of the Cumberland Trail. The purpose of the Friends nonprofit is to protect the environmental, cultural and historic resources of the Cumberland Trail corridor and support park needs.